Draintech use STC25 Manhole Survey Software which allows us to record details of the manhole structure and condition, diameter of pipe inlets and outlets, depths of inverts and cover conditions. Manhole surveys are often required when drainage system records are poor or non-existent, for use on 'Critical' sewers to address specific issues or as infill data on networks lacking detail. 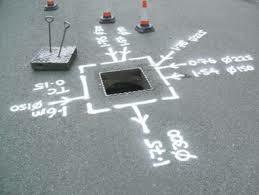 Our Manhole Cards include details and photographs of the cover lid and location. Our engineers use GPS equipment to record Eastern, Northern and Cover Levels of surveyed manholes. Draintech are able to carry out Manhole Surveys in conjunction with CCTV Surveys giving you a fully customised report on your drainage systems. All surveys are carried out in accordance with the WRC Model Contract Document for Manhole Location Surveys and Production of Record Maps (STC25). Data can be delivered in a variety of formats to suit your needs including stand-alone manhole cards, STC 25 Databases or hyperlinked data driven from a CAD drawing. At Draintech we have the experience in this field to work on schemes from 8 to 80,000 manholes.